I dreamt I was being harassed by a peacock who wanted my antique beaded bag that Steve’s mom gave me 33 years ago (where is that bag now?). In the dream I was carrying the little bag inside a big purse. The beaded bag is in peacock colors and that bird was determined he (?) would get the bag. I finally stood up to the big bird and said “Go home!” and he went to the house across the street. I followed him and knocked on the door, prepared to ask them to keep their dangerous peacock at home. A lovely Persian woman opened the door and I could see the house was full of Persian women and children having some sort of daycare cooperative. I know that Persia is now Iran, but in my dream they were Persian. I can’t even begin to fathom what this dream was about! Your night dreams make my day, Jana. And the illustrations really are charming. I love that face and beak zoning in on that bag. I also love the note about the inspector nixing the chops in your fridge. If she saw the condition of my fridge, she’d nix everything. I think maybe it’s a call to open yourself up your paintings to more intense colour and pattern and to not let people who maybe seem more a bit more exotic than you feel right now keep the colour and pattern all for themselves. Or maybe you feel you’ve lost your feeling for colour and pattern and want it back? In which case the big purse is you and your artistic self is the little beaded bag. Think Persian carpets and garments and the colours and patterns of peacocks – see what I mean? Thank you ever so much for the fabulous dream interpretation. I really like what you came up with and find it quite inspiring. Much better than my pedestrian ideas! I would definitely like to translate my crazy colorful dream drawings into oil paintings, and want to find a way to loosen up with oils and get just as playful as I do when I draw dreams and sketch daily life. You and Chloe (who also commented) have given me a good push in that direction! Have I been missing this side of Jana’s work? I think the combination of text and art is lovely and produces some interesting composition features. The peacock reminds me of one of the flamingoes in Alice in Wonderland. This whole picture has the feel of a Lewis Carroll illustration of Alice. Love the line of windows. Jana, you should do more of this. It is really very strong. Thanks Annie and Chloe, Someday I want to find a way to integrate my crazy ink & watercolor dream daily life sketches with oil painting too. My dreams are usually both odd and colorful and visual. There are many more on my blog which you could find via search for dream or category. Jana, I’ve been reading your blog for quite a while now and the illustrations of your dreams are my favorite posts. Thanks for sharing and all the best for the coming year. Hi Jana – you made me laugh out loud again. What a delicious dream – I would say yes indeed your subconscience is screaming for you to go wild with colours and not restraining yourself in any way!! 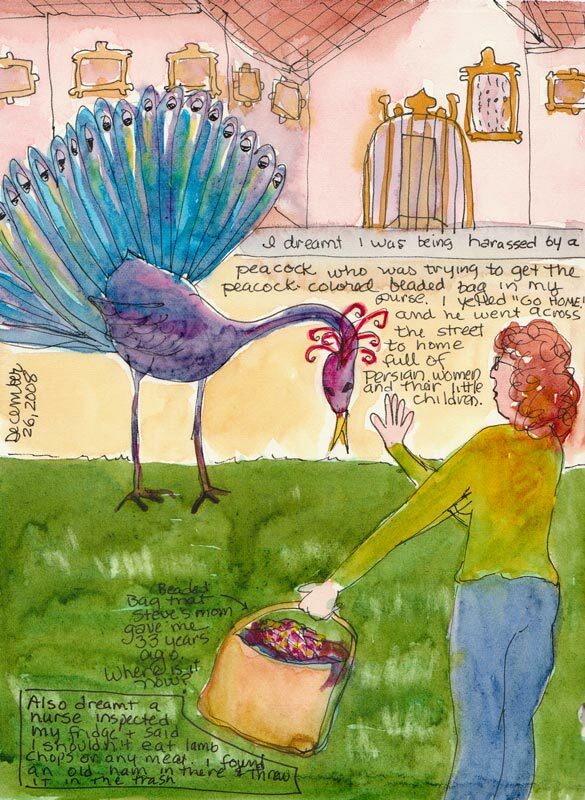 And where the peacock is coming from – have you been perhaps on my website??? There I was talking about my triptych with a peacock and Krishna and Radha riding on it – which was an absolutely crazy project where *I* was going wild completely. I am looking forward to new colourful oilpaintings!!!! Hi Jana, I must admit that I don’t have a single photo of me working on the wood. It never came to my mind that someone could ask me for it one day! I can tell you it’s a messy work especially when you have to clean up each evening – LOL. The next time when I am working with my buzz saw again – yes I have a small one for indoors use on a table – I will get my partner to make a photo! I really love working with wood and tools and making lots of noise – LOL.